Many of the free patterns on this site refer to a turned under hem or provide instructions to turn the hem under and under again to enclose the raw edge and then sew the hem in place. This is sometimes called a baby hem or a turned under hem. It is also one of the simplest hems to sew. Twisted Fabric- the fabric doesn't lay smoothly. This usually happens on a curve or the bias grain of the fabric. The finished hem wants to flip up. There is a way to prevent this. The following instructions are in detail so that you can have perfect results every time! Possible hand sewing needle and thread - this is especially helpful if you are sewing a silky, slippery fabric. The first step for a baby or turned under hem is to turn under 1/4". Note: If you are following a pattern and the pattern calls for you to turn under 1/2" or a different measurement, follow the pattern and substitute the amounts in these directions. A straight edge can be measured and pressed under (to the wrong side) 1/4". 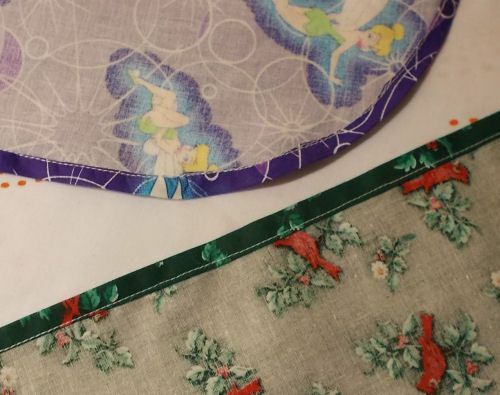 Although it is not necessary, this is a great time for beginners to experiment with following a straight line on the sewing machine, by sewing a line of stitching 1/4" from the edge and then using the line of stitching as a guideline to press. If the fabric is curved, it is best to sew a row of basting stitches 1/4" from the raw edge. The stitching line becomes the fold line and this row of basting will also be used to ease in the fabric so that it fits the area into which it is being turned under. Note: When sewing a line of basting stitches or a guideline of stitches, consider using bobbin thread to prevent excess bulk. Turn under again 1/4". You can measure again or use the previous turned under area as a guide. The important part is to be accurate and press well. If you have been sewing for a while, you understand easing versus gathering fabric. Turning under a curved hem is apt to have tucks of fabric rather than a smooth flowing line. Using the row of basting stitches, you will draw the threads of the fabric closer together to each other so that they will fit the area into which you are turning them under. Secure the hem. Use straight pins to hold the hem in place or hand baste the hem in place. If there is a curved area, consider hand basting the area with a long running stitch, near the center of the hem so the basting stitches will not get caught in the machine stitching and can be easily removed. Your goal is to stitch as close to the edge that was pressed under first to attach it to the body of the fabric. This can be achieved with hand sewing. Hand sewing is usually done to eliminate any stitching from being seen. Machine sewing is the fastest way to sew this type of hem. You will want to line up a guide on your sewing machine so that the stitching will be as close to the first folded edge as possible. This will prevent the hem from flipping to the wrong side and keep it laying smoothly.